Every summer since 2003, emails make the rounds talking about how Mars will appear as big as the full Moon. This is complete nonsense. I received my first Mars Hoax email of the season last week and thought I should clear the air. On August 27, 2003 Mars and Earth lined up in what is known as an inferior conjunction or opposition. This is a normal astronomical event which happens every 26 months. That year the opposition was special because it was closer than normal. A lot was made of the fact that at 55.7 million km it was the closest Mars and Earth had come in almost 60,000 years. A more realistic view is that Mars and Earth oppositions bring the two planets within the wide range of 55 to 101 million km. But they only get to close end of this range every 7 or 8 oppositions (e.g. 1956, 1971, 1988, 2003, 2018, 2035, 2050). When Mars is in close opposition it is nearly twice as close and will appear nearly twice as big. During these close oppositions Mars will appear much brighter than normal but you will still need a telescope to see it. These close oppositions are the very best times to see Mars through a telescope. The neighbouring oppositions (e.g. 2001, 2005, 2016, 2020) also allow excellent viewing opportunities. What about 2009 through 2012? Sorry, for 2009 the Earth is still catching up to Mars. The distance is closing but it's still over 280 million km away (see this neat real-time Earth Mars distance calculator). Last December the two planets were on opposite sides of the Sun and almost 400 million km apart. The next oppositions in 2010, 2012, and 2014 are among the farthest and least interesting. So when the Mars Hoax email comes around in one of these poor years - enjoy a chuckle. 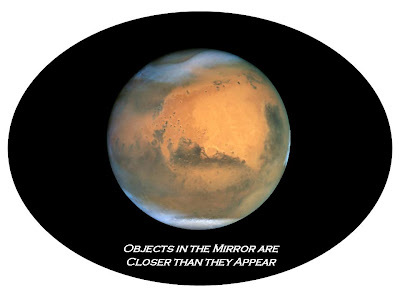 Mars will continue to appear smaller and smaller until after 2012 when it begins to return to its regularly scheduled close oppositions. So in that sense, Mars is shrinking. Click here for tables of Mars oppositions and closest approaches and a technical explanation at SEDS (Students for the Exploration and Discovery of Space). The diameters of Mars and our Moon are about 6752 km to 3470 km or just about 2 to 1. For Mars to appear the same size as our Moon it would need to be much closer to us. About twice as far as our Moon in fact. At that distance Mars would be inside the Earth’s Hill Sphere and we would either have a second moon or be in really big trouble (see the picture above). "Rocket-Bye Baby" used a close approach to Mars in 1954 to set up a cosmic mix up where a Martian and human baby were switched. In the 1958, "Hare-Way to the Stars", Bugs Bunny foils Marvin the Martian's plan to blow up Earth with the Illudium Q-36 Explosive Space Modulator because it obstructs his view of the planet Venus. Posted by Mang (433rd) at 11:11 a.m.
June 30, 2009 at 8:00 p.m.